It is sad to hear news of deaths due to stampedes. These could have been avoided. We had the major Hajj stampede in 2015 and now we have another stampede at Mumbai in a suburban railway station. Hindu temples seem to be designed for stampedes, with a complete wiki list associated to it now. The news of stampede results in common reaction of blaming the authorities for poorly designed entries/exits, narrow lanes/bridges, bad crowd behaviour, law and order problem, and sometimes the victims are blamed for panicking and creating stampede. While it is obvious that we need to evolve standard evacuation procedures in all crowded areas, and ensure that public spaces are redesigned to handle the peak load properly, it is easier said than done, especially when the areas involved are matter of faith, like temples. It is in this light that I feel that we should use mathematical methods to arrive at an indicator, which can be used to mandate a redesign of public areas to avoid stampedes. For a long time, I have felt that stampede as a phenomenon mimics fluid dynamics. I come from a background where my day job for years included working with fluids and modelling their dynamics in application. I avoided thinking in this direction to avoid being the man in the adage - for a man with a hammer, everything is a nail - till very recently. This article in wired partially reflects how I think about stampedes. Fluidically speaking, it is problem that boils down to compression within a rigid boundary, with defined inlets and exits. The fluid in this case are people themselves, with the property of being partially compressible upto a point till the air gap between people reduces, and then the fluid may be treated as incompressible. A gas dissolved incompressible fluid would be a good example. In stampedes, the deaths usually happen during the second stage, when the fluid is incompressible, that is, people are pressed against each other without any gap between them. Most deaths are due to chest compression and haemorrhage, and a few due to suffocation. Stampede therefore is a surge pressure problem in the given conditions. The pressure suddenly shoots up in the area of stampede as people press against each other to the extent that some get compressed, some fall down and are stamped upon, and some die due to lack of air. Basically the circle of death in a stampede region, given the nature of injury, has to be akin to very high pressures in fluids that develops suddenly due to a sudden negative change in volume that leads to shooting up of pressures. This is called a pressure surge or pressure spike, most likely accompanied with an additional transient or perpetuating oscillatory component arising out of the second order differential nature of the behaviour. You may imagine a response to impulse initiated due to the push of some people in the crowd leading to a surge, occurring due to, and leading to, more heaving back and forth, with pressures rising to very high levels at some places in the cramped crowd. The best solution to avoid stampede is to design spaces to accommodate the crowd. However, this suggestion is not practical, most stampedes happens at places designed many years ago for a population that was a fraction of today's. There is no point ruminating over lack of foresight or shortsightedness or whatever. For the purpose of this post, I shall concentrate on mitigating factors assuming surges would happen despite whatever. a) Creation of surge relief points - this would practically mean, anticipating and giving emergency exits at multiple locations at crowded areas that open automatically to pressure. They should open up to empty spaces. b) Creation of accumulators to avoid sudden surge pressures - this would entail creation of empty voids, spaces or rooms which may usually be empty or semi-filled, without doors, but which can accommodate people in large numbers in case of an emergency. c) Streamlining people's movements- through steps such as smoother curves and bends, smoother ramps over steps, avoiding sudden reduction in areas in the direction of flows. d) Creation of rupture areas/intentional failure zones - the areas that give in or break if crowd pushes against it. 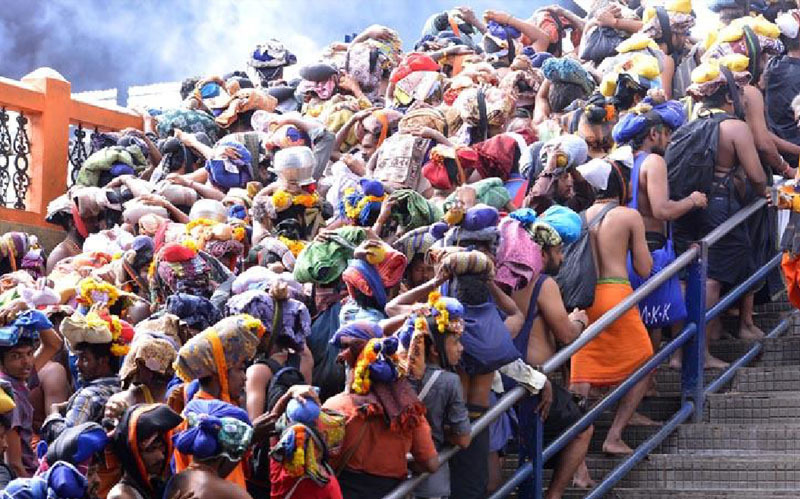 e) No sudden opening or closing of entries/exits/not allowing surge loads - when such a situation arises at places, for example the opening of temple doors for darshan, or arrival of simultaneous trains at the station, or ending of multiple movies at the same time in a multiplex, things need to be timed properly keeping in mind the stampede protocol. The above is just an indicative list. A competent group of engineering students should be able to design a simple model on stampede, based on their fluid dynamics knowledge, and arrive at various parameters and constants needed to arrive at the equations and solution for a given design of a structure or passage. I assume that arriving at the properties of the imagined fluid, that is properties such as compressibility of people in public spaces would be the tricky part. One may rely at empirical methods in such conditions, or go for simulated experiments. Once done, this model could be used to evaluate if a given public space is safe from stampede point of view or not. A rough estimate should not be very difficult to arrive for each structure we already have, very quickly, and plug such gaps. Probably Mumbai local trains and the platforms, followed by some of the crowded temples should be an ideal starting point.